DECALS: one aircraft "Whistlin' Britches"
The P-39 is a famous story of un-realized potential. The Airacobra was a unique design, with a mid-mounted engine. The prop was driven by a long shaft extension. This gave the aircraft very clean lines, and also left the nose area available for heavier armament. The P-39 carried either a 37mm or a 20 mm cannon that fired through the propeller hub. The prototype XP-39 was a fast airplane, with good performance. However, in the course of turning it into a production fighter, the Army Air Corps added a lot of weight in the form of armor and other military equipment, and deleted the supercharger from the engine. This had the result of significantly reducing the aircraft’s performance, especially at altitude. The P-39 was used as a fighter in the early days of WW2, when nothing better was available. The British tried it and didn’t like it, and it was only used by the US Army in the South Pacific until better aircraft became available. The aircraft did see some success as a ground attack plane. The aircraft was sent to the Soviets in large numbers, who used it very effectively as a ground attack aircraft. The success of the aircraft in this role kept newer variants coming off the production lines, and spawned the P-63 King Cobra. This is another of Revell’s old WW2 1/72 scale fighters. My copy of the kit has a 1982 copyright, and is in a 1980s style blue stripe box. I’m pretty sure this is the same model that was released as kit H-67 in 1974. I think it was last released as a P-39F by Revell of Germany. As a 1970-vintage product, the kit is similar in many regards to other kits of the era. The kit has raised panel lines and rivet detailing. The lines are reasonably fine, and at least the rivets are not the golf balls found on some other kits from this era. The cockpit consists of a pilot figure and an armored seat with headrest. There is no detailing on the inside of the fuselage sides. The canopy is fairly thin, and looks clear. The kit consists of 31, molded in a medium green. Panel lines and rivets are raised, but finely molded. (No golf-ball sized rivets here!) My model had very clean moldings— no signs of mis-alignment, with a little bit of flash. Trailing edges seem to be pretty fine, though they all have a little bit of flash. I’ve included a shot of the fin and rudder, which should give the reader a pretty good understanding of how the surface detail looks. The instructions do not show an option for building the model wheels up, but the gear doors are separate parts, and could probably be installed in the closed position. There is no wheel well detail. The model includes the left half of the engine. The engine access panel on the left side of the fuselage is intended to be removable, so you can see the engine. I’m pretty sure the P-39 was the only Revell kit in this series of WW2 fighters to have this feature. I guess the folks at Revell thought the P-39 was so unusual, that the mid-engine had to be shown off. Of course, the one piece engine molding is nothing great to look at…. 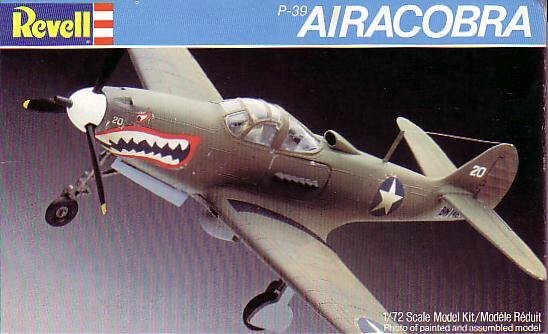 This model is described as a “P-39 Airacobra”. There is no information about which model it might be-- I think this kit is intended to be a US Army Pacific theater “D” or “F” model. I also think the same kit has been released as a later model, with Soviet markings. 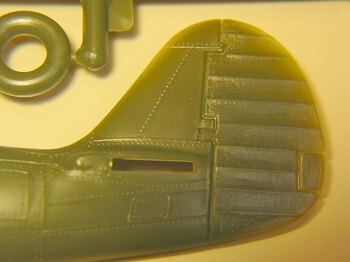 The kit includes the under-wing gun pods carried on later versions of the P-39. These guns are called out in the instructions as parts that are not used. The instructions are the typical pictorial style, with warnings and color definitions in about 12 different languages. There is a nice four view of the plane, showing colors and decal placement. Colors are given as generic names only: grey, white, tan, light olive, etc. This kit is probably only of interest to collectors. Builders will probably opt for the Academy P-39 Q/N, which features engraved panel lines and a better interior for a bout $10. I bought this kit for a couple of bucks at a swap meet, to add to my collection of in-flight 1/72 models hanging from the office ceiling. This kit met my basic needs - inexpensive, reasonably detailed exterior, has a pilot, and can be built wheels-up. 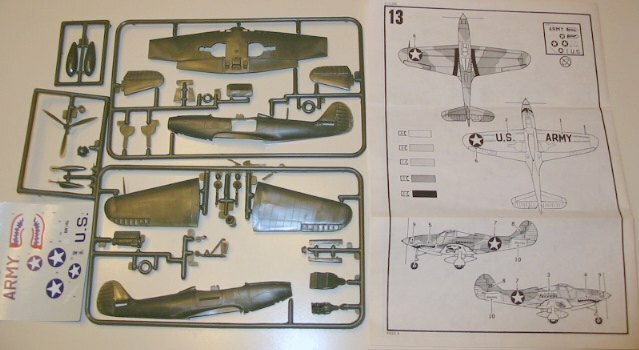 The only other option in 1/72 scale for a P-39 is the Heller P-39Q, which is probably about the same as this kit in terms of quality, and is still available for about $5. Super-detailers will not want this kit-- go build the Eduard kit in 1/48 scale!